A family adventure of a life time suitable for children aged 5 + Explore bustling Marrakech, UNESCO World Heritage sites and then venture out into the Sahara for camel trekking and wild camping. This holiday has been devised for adventurous families wanting to do something very special in their time off. The itinerary has been designed to fit into a half term break, but if you have more time, then it can be expanded to include longer in the desert and Marrakech. This holiday starts and finishes in Marrakech, a beguiling city which will entertain and intrigue both adults and children with its narrow, winding streets, bustling markets and the lively Djemma el Fna, complete with snake charmers, drummers and acrobats. For those who like a dose of culture, there are palaces, museums and gardens to explore. After you've had your fill of the chaos, you will head out over a spectacular mountain pass, crossing the High Atlas Mountains. The landscape changes by the hour, from deep valleys and sheer drops , to barren plains and rocky desert. Your first stop is the Kasbah Telouet, a crumbling kasbah housing some fantastic mosaics and gorgeous views. From here, you travel to your first night's accommodation close to the world famous Ait Ben haddou. Recognisable from films such as Gladiator, this Unesco World Heritage site is a fortifies city built on a hill. The site is reached by stepping stones over a river and visitors are free to explore at their leisure. You will then head into the Sahara, passing along the Draa Valley, dotted with kasbahs and palmeries. Staying in a friendly, laid-back guest house, you will camp in the garden in a traditional Berber tent. With dunes in the back garden, children are free to explore, whilst parents can relax in one of the shady areas. The following day, the camels will be loaded up and you will head off into the dunes with your guide. Trekking for about 2 hours, you will cross dried up river beds until you find somewhere to camp. Whilst your guide sets up your private camp, you are free to explore the dunes and make as much noise as you want - there will be no one else around. After your wild camping and return camel trek, there will be a chance to freshen up before continuing your desert adventure, this time staying at an oasis town. Staying in lovely accommodation with a pool (and resident donkey), you will be able to explore the farm land and wander through the date palms. Your holiday ends in Marrakech, where there will be time for s quick spot of shopping before catching your plane home. You will be picked up from the airport and transferred to your riad. If you are arriving on a late flight, you might want to consider pre-booking dinner on this first evening so that you can relax after your flight without having to worry about finding a restaurant. Leaving the pink city behind, you will head out over the spectacular Tizi n' Tichka mountain pass snaking its way over the High Atlas mountains. Watching the terrain changing shape in the space of a few hours is incredible. Donkeys carrying huge loads, women working in the fields and shops with large meat carcasses being hung out to dry - not to mention the cacti, almond trees and deep mountain valleys. You will stop for lunch in the small town of Telouet, before visiting the town's main attraction; the Kasbah. Built in the 1800's by the Glaoui family, the Kasbah enjoyed a prosperous strategic position on the trans-Saharan trading route and close proximity to the area's salt mining industry. After Morocco's independence in 1953, the Glaoui family was evicted and the Kasbah was left to ruin. Visitors catch their first glimpse of the Kasbah as they drive into Telouet; an imposing building standing proud on top of a small hill. On closer inspection, the walls are crumbling and close to collapsing. The entrance to the building is no less dilapidated, with incomplete walls and rubble. As you walk through the corridor, it is unclear what makes the building so remarkable, with its bare, neglected walls. It is only when you reach the heart of the building that you can understand the significance and fallen wealth of the Kasbah. Stunning mosaics and intricate wood carvings adorn the walls, reminiscent of the Bahia Palace in Marrakech. The attention to detail is most incredible and the work and money spent on building it is unfathomable. After being astounded by the mosaics on the first floor, more treats await you, with far-reaching views of the valley and mountains beyond from the roof terrace. After your visit, you will continue on to your accommodation close to Ait Ben Haddou. Today is a day at leisure for you to explore the area. After a relaxing morning, you will almost certainly want to go and visit Ait Ben Haddou. Best enjoyed in the afternoon, after the day trippers have left, you can either visit by car or on foot, depending on how active you are all feeling. The walk takes about 2 1/2 hours and you follow the river through the valley. Ait Ben Haddou itself is essentially a small, fortified town. Designated by Unesco as a World Heritage site, it has been well preserved and restored, thanks to the film industry who have used it as the set for several Hollywood films, including Gladiator. You can climb on the crumbling buildings and see up close how they have been constructed out of mud and straw and get a real insight into local architecture. Then, you can climb to the top, for far-reaching views of the wild desert and mountains. There is a small tea house along the way where you can stop for a refreshing mint tea. This morning, you will have the chance to have a slow morning, perhaps sitting in the shade of the palms and reading, whilst the children play hide and seek in the small dunes in the grounds of the guest house. After lunch, you will saddle up the camels and head off through the valley, towards some deserted dunes. Because most people head to the larger dunes at Erg Chegaga, you will find that you have this piece of the desert to yourselves. As your guide walks you along, you can sit back and enjoy the scenery (from your bumpy vantage point.) You will arrive well in time for sunset and you can clamber up the dunes (and run down them again) to your heart's content. As night falls, your guide will light a camp fire and your family can enjoy dinner al fresco in this very special, private camp. After breakfast, you will get back on your camels and head back to the guest house. Once you are back, you will have a chance to have a shower and freshen up before getting in the car and driving to Agdz. You will leave Agdz after breakfast and start the journey back to Marrakech. Driving back over the spectacular mountain pass, you will stop for lunch with panoramic views of the High Atlas Mountains. You will arrive back in Marrakech in the afternoon. You will be transferred to the airport to catch your flight home. This itinerary has been put together to be able to fit into a half term break (just). If you have more time at your disposal, you might wish to spend more time in Marrakech. Please contact us to discuss your requirements. Today we suggest you set off and explore Marrakech's medina. You can spend all day pounding the souks and taking in the atmosphere or visit some of the main cultural sights of Marrakech, including the Medersa Ben Youssef, Palais el Badi and the Bahia Palace, interspersed with a leisurely lunch watching the storks nesting on the ramparts of the ancient city. In the evening, be sure to head down to the main square here food stalls, acrobats, snake charmers and story tellers congregate creating an unforgettable atmosphere which is compelling for adults and children alike. You will stop for lunch in the small town of Telouet, before visiting the town's main attraction; the Kasbah. Built in the 1800's by the Glaoui family, the Kasbah enjoyed a prosperous strategic position on the trans-Saharan trading route and close proximity to the area's salt mining industry. After Morocco's independence in 1953, the Glaoui family was evicted and the Kasbah was left to ruin. Visitors catch their first glimpse of the Kasbah as they drive into Telouet; an imposing building standing proud on top of a small hill. On closer inspection, the walls are crumbling and close to collapsing. The entrance to the building is no less dilapidated, with incomplete walls and rubble. As you walk through the corridor, it is unclear what makes the building so remarkable, with its bare, neglected walls. It is only when you reach the heart of the building that you can understand the significance and fallen wealth of the Kasbah. Stunning mosaics and intricate wood carvings adorn the walls, reminiscent of the Bahia Palace in Marrakech. The attention to detail is most incredible and the work and money spent on building it is unfathomable. After being astounded by the mosaics on the first floor, more treats await you, with far-reaching views of the valley and mountains beyond from the roof terrace. After your visit, you will continue on to your accommodation close to Ait Ben Haddou. After yesterday's drive & camel riding, today is a day at leisure. You can spend the morning relaxing around the pool and then in the afternoon, you might want to take a stroll through the palmery. Walk through the towering date palms, past large cacti and then through lush farmland, with beautifully maintained plots. If you're lucky, a local farmer might invite you to take a look at his land and point out the different vegetables and plant that he's growing. Guide price is based on recommended accommodations. Alternative accommodations and upgrades are available. Please get in touch or click on 'alternatives' below for alternatives and upgrade options. Flying from the UK... Marrakech has an international airport (RAK) which is serviced by several airlines flying direct from the UK. The flight time is around 3.5 hours. On average it takes around an hour to clear airport security and then around 15 – 20 minutes to drive to the Medina or 1 – 1.5 hours to reach the Atlas Mountains. All airport transfers, a driver, all inclusive accommodation in the desert, camel trek & wild camping excursion, breakfast and dinner in Ait Ben Haddou and breakfast in Marrakech & Agdz. This trip is not available in the summer, as it is simply too hot in the desert. If you are planning a visit in the summer months, please contact us for alternative suggestions. It goes without saying that this is not a standard family holiday - it is an adventure holiday that children are welcome on. Accommodation, attractions and camel trekking are all undertaken at your own risk with parents taking full responsibility for children. There is a fair amount of driving involved in this trip and the distances are large, on some days you will be in the car for up to 5 hours. However, there are plenty of photo opportunities along the way . The camping in the desert is wild, which means that there are absolutely no bathroom facilities. If you don't fancy this extended camping trip, we can arrange for you to have a short camel excursion and camp in one of the tents in the garden. Flights with Royal Air Maroc both good, even 30 min early arrival in Marrakech. Transfers to/from hotels smooth (in spite of late hour arriving on the way there). Treks in the Atlas Mts were superb in the spring. The Tassoult Valley was a treat for the senses, with wild flowers, tree blossom, birds (including nightingales every few hundred metres up the valley),rock formations and the frequent river-crossings. Not to mention the friendly local Berbers riding their mules to work, the children walking to school, women and children in colourful clothing. Magdaz was fascinating, with mint tea served on the roof of the agdz(?) or storage towerhouse, by the kind owner's daughter, complete with views of the mountains. There were few signs of other tourists, but this may change soon as the new access road nears completion. There were some interesting driving experiences through the river in the mean time! The desert trek and camp near Oulad Driss made for another fascinating experience. Because it was pre-desert, with a mix of dunes and vegetation, there was more of interest than a true desert. Desert plants, insects and birds, sunset and sunrise made for some very photogenic moments. Add three camels and our two sons (aged 12 and 18) to the journey for further entertainment. The boys voted this the best part of the holiday. Shame it was only 2 days. The highlight was, for some, a camel spider in the tent, bottled and then examined and released the next morning. Some found it hard to get to sleep that evening! Ait Benhaddou and Telouet provided a more historical slant on Morocco, ably escorted and informed by our guide Rasheed. The link between Ait Benhaddou and the film industry is a well- known attraction, but I will remember it equally for finding my first wild scorpion! Telouet is more remote, and just as interesting, and is accompanied by strikingly-coloured rock formations en route to Marrakech. Marrakech is very much an acquired taste. It took us 24 hours to get used to the Medina and the souks, although we never actually got lost. Finding our way around (fairly) successfully, learning to ignore hassling vendors and haggling with others were all satisfying achievements. Recommended places/activities would include Palais La Bahia, Maison Tiskiwine, the Artisan zone on the western edge of the Medina, just wandering around the souks and market areas (especially the northern bits), and of course the Café de France terrace overlooking the main square (Place Jemaa-el-Fna) in the evening. Although some of the vendors were a slight nuisance, we did not feel threatened at any time. Some vendors will need to work on their patter, however. Being told by a waiter that we were a skinny family so we needed a meal at his restaurant was amusing rather than persuasive! Travelling by 4x4 in Morocco was generally a good experience. Road surfaces were variable, according to how remote the area was, but we were too busy being distracted by the scenery to be bothered by any potential discomfort. The only slight trepidation felt was when one driver we had seemed to be playing 'chicken' with oncoming vehicles, on the single lane desert road heading towards M'hamid. Otherwise the driving was smooth and very considerate, especially on the rougher roads. Accommodation was very good. We were made to feel welcome everywhere. The hostel at Ait ali n Itto was basic, and could have done with the hot water actually being hot, but we accepted that this goes with the territory in a remote area. All the riads we stayed in were very hospitable and generally provided good facilities. Riad Caravane at Ait Benhaddou and Dar Hanane in Marrakech were especially good quality, and welcome after roughing it for the previous 4 or 5 days. Eating breakfasts on the terraces in the mornings while watching the Atlas birdlife, or listening to the Imams in Marrakech successfully calling the faithful to prayer, was memorable. Our guide, cooks and drivers were all excellent. Rasheed our guide was exceptional. He entered into the family spirit really easily, was a goldmine of information wherever we were, smoothed the way for us on many occasions. This included helping my lack of balance (due to a bout of labyrinthitis) by making a walking stick from a sapling so I could get across the Tassoult river without falling in. He acted as nurse for cuts and blisters on a number of occasions. His thoughtfulness and anticipation could not be faulted. He also seemed to have a very good rapport with the locals he needed to deal with. He was flexible enough to accept my idea of eating a takeaway picnic at an oasis near Zagora when returning from the desert. Abraham our first cook was much appreciated for his huge breakfasts, picnic lunches on trek, snacks on return and evening tajines. We were sad to see him leave us after 3 days. All tips given were easily merited. Thanks to Tourdust for giving us some ballpark advice on this. So overall a marvellous Moroccan family adventure, scoring a big 5 out of 5. I wish we could do it all over again, and then some more. Dar Thania was great - good location and Momo (the manager) was brilliant. Only comment here (and it was not a problem for us!) was that the itinerary said the whole riad but there were other people staying there throughout our time there. As I say, it did not impact on us but the boys are not the quietest. breakfast was great and they were very flexible with timing. Rooms were lovely. The desert camp was amazing. The drive there was tough but once there, it was definitely worth it! Not sure they really got vegetarian food (but food was generally great) but that is not uncommon. Sundowners overlooking the dunes will be tough to beat! We went on a camel trek and the boys spent a lot of time running down sand dunes and trying to sand board. Our driver was good (Toufic) - on the way out there, he took us to Ait Ben Haddou and on to Ouarzazate for the day and we had a couple of extra 'cultural' stops on the way out. Overall, everyone arrived when they should and only comments are as above. Overall five out of five for the trip. Thank you so much for your help with organising this. I don't think 2 weeks on a beach will cut it next year! Overall the trip went really well, we are certainly happy about your choices and organization -- and if you knew us well, you'd know that is really an achievement (it's our first time on a trip arranged by "others"). - Dar Sidi Bounou: Nancy, Said, Raika, Ibrahim,the other people and the place will stay with us as the highlight of the tour. The experience was like being guests at the house of someone from Morocco, and truly left warm and deep memories - conversation with Nancy has been very interesting and instructive, and Said in particular is exceptionally good and caring. Curiously, the main deviations from the trip plan happened there, with the first night being planned for a "room" but actually spent in a berber tent(not sure Nancy thought that was the better thing to do, but we had not prepared our luggage/stuff for that setup, nor our minds... Our fault was however not telling Nancy about it, not sure why -- I'm sure she'd have obliged and moved us to a room. Also, that night, a pack of stray dogs 'camped' around the area, and barked all night, keeping me awake -- we only think that Nancy, who's obviously fond of dogs, shouldn't perhaps try to rescue or adopt what comes around (one of the dogs she had taken care of was the 'lead barker' against the pack I guess). Finally, the desert ride was not were the plan said (wild camping) but it was decided to go to a bivouac (the reason was the day before had been windy)-- it did go well overall, but as the other episodes, these options should be probably anticipated in the plan, just to be clear and set expectations. To reiterate however, this was the best part of our trip anyway, given the overall experience of the two days and the people. - and finally, the places (to visit, I mean: Telouet, Ait Ben Haddou, M'Hamid and Agdz) you selected on the trip were thoroughly interesting and fascinating, just the types I would have selected myself. It was totally awesome!! Climbing the Toubkal summit by moonlight is just breathtaking!!! Yes it was absolutely freezing and so glad I took layers of thermals and hat and gloves!! The Riads you booked were great, we both loved them, although we preferred the second Kasbah in Imlil we stayed in to the Kasbah Toubkal on our first night, our room was great especially after being in hostels for several nights!! Boy were they cold!!!! El Fenn is fabulous, Lilly Allen had been staying with her band that week and left the day we arrived! Love that place, we are planning to go back next year! Caravanne was like walking into a little boutique hotel, loved that place as well. There's something special about the mountains, loved it! The desert camp was really well organised, although to be honest I think two nights are enough as there is not a lot to do and it is blisteringly hot by 9.00!! But we were looked after really well and had my first glass of wine for two weeks, went down very well!!! The sundowners were so much fun, especially trying to walk through the dunes after a couple of wines!! Really great adventure and thank you so much for putting such a fab trip together for us! We had a a wonderful time in Morocco. We were delighted with our guide Mustapha. He was a brilliant pairing for us as he tuned into what we liked and didn't, taught us lots about history, culture and geology and really looked after us at all times. I would recommend him to anyone in the future. Hamid our muleteer and Sayed our driver were also excellent. We loved the itinerary that Rebecca put together for us. She was right about how much we could fit in and so we will have to return another time to try Essaouria! Apart from the additional bed-fellows during the trekking (which was in itself a learning experience! ), we were really happy with all our accommodation. We loved the fact they were small, often family run and that the staff would look after you completely. It was so reassuring to see the clear process of quality assurance by Tourdust. It was great to meet Anna at Riad Adore and to know that the company really is passionate about its customers having a great time and the lengths they go to test that for themselves. We were really happy with the service we got from Tourdust which can be best described as friendly, efficient and expert. The team showed genuine interest in us and our trip and I felt that Rebecca was almost as excited as we were by the time all arrangements were in place. The information pack provided was invaluable too and I must admit I printed the lot because it turned out to be more useful than guidebooks. We usually travel independently and like to do so. We'd forgotten how relaxing it can be to have someone do all the hard work of planning and scheduling and even making a decision of where to stop for lunch. I'm certain that these things made the holiday the special experience that it was. I am struggling to think of just one thing which could have been improved. The only thing I can think of is to add 'hat and gloves' to the itinerary for the Toubkal summit. Although I think this is included in the winter trekking advice, I don't think its listed otherwise. It was darn cold up there due to the wind chill, but Mustapha had a spare pair so I was ok. If I missed it on the list then apologies. We have just returned from Morocco after a splendid trip. Thank you very much for organizing such an excellent trip. The planning and detail put into every aspect of the trip was very obvious and ensured we had such a great holiday. The four days trekking were superb, culminating in our ascent to the top of Mount Toubkal with its spectacular views and breathtaking scenery. Our guide, Yusuf, was very able and professional and we were particularly impressed by our cook, Abdullah, who produced excellent food, meal after meal, without exception. We were also impressed by the very high standard of accommodation, particularly Kasbah Ellouze and Dar Hannane whose manager, Mohamed, and assistant manager, Azziz, were incredibly friendly and helpful. Purely for information and feedback purposes, the only slight hiccup, in an otherwise flawless holiday, was the fact that the driver we had for the two day trip to Ait Benhaddou had little or no English. Once again, thank you so much for all the planning and detail you put into this trip. As per your e mail, on a score out of five, we would award five out of five to Tourdust and would have no hesitation in thoroughly recommending your company to any prospective traveller. None of us are on Facebook but please feel free to use any of the above comments in any of your promotional material. We would love to use Tourdust again in any future trips and with that in mind look forward to being in touch with you both again. The trip was fantastic and we felt like we had been away for a month rather than a week! Dar Vedra was outstanding and perfect for the souks and the main square. The service was very attentive and the apartment was wonderful with big, fluffy towels and great breakfasts, with brilliant coffee. The only issue there was the call to prayer which seems to be right above you at 5 in the morning, being so close to the mosque. You get used to it but it is very loud. The driver (Said) was very good but the journeys took significantly longer than expected. It took us 12 hours to get to the desert rather than 10 and he did seem to take his time often when it was safe to pick up the pace. On the way to Kasbah Azul from the desert it took 7 hours rather than 5. This was partly due to there being a sand storm but it seemed to be a theme. We ended up mentally adding a few hours to the proposed times. He also seemed to stop for lunch at the regular tourist haunts where all the other drivers congregated and there was an expensive set menu for substandard fare. It's tricky to avoid when you don't know the area but maybe it would be useful to offer info on the best places to stop for food en route. The desert camp was brilliant and I can't praise it enough. The service was excellent and the atmosphere was wonderful and we felt very much at home. It is the perfect size. Nick was there when we visited and he says hello. Kasbah Azul was so-so. I was not impressed with the service or the atmosphere to be honest, although it has a nice pool. I was glad it was only an overnight stop. Riad Caravane was beautiful and the decor, service, views and location were all wonderful. There was a mosque next door but thankfully they were quiet at night! Overall it was fantastic. Thanks for all your help in making this happen. he trek in the atlas mountains was amazing. We think this was our favourite part of the trip as you could really appreciate the beautiful natural and different landscapes that Morocco has to offer. Our accommodation was great. Douar Samra is just so nice. We never wanted to say goodbye to such a cozy and beautiful place. Mohamed, our guide and Rashid the cook where great companion during all the trek and we really felt comfortable with them. The accommodation during the trek was good as well as we got the feeling for a little more of adventure and less luxury, we where actually looking for that so we founded it great to get outside our comfort zone. The actual trek was very good and it went from easy to hard in the following days. We really had a sense of accomplishment after the last day which was demanding because of the snow. The stay in Marrakech was very nice. We really liked our accommodation there (Dar Hannae). The perfect description for that place is a peaceful oasis in the middle of a beautiful and hectic city. The staff(Mohamed and Aziz) there are amazing and made us feel like home. The Desert Camel trek was very beautiful as well. Even though we had a lot of time travelling in the car, Hassan, our guide again and Driver made the trip nice. The accommodation in the Dra Valle was very nice and we happened to notice that Mohamed changed it for us in the last minute so we could had a more pleasant stay. Dinner that day was spectacular. Even thought the desert is a must do it does feel like a more worn out and popular tourist trip. In general we loved the trip and we are very happy with Tourdust. We always felt like you guys where taking care of us and always trying to get the best out of the trip. Just wanted to send a note saying we had a wonderful time...the staff and hospitality were fantastic! Our kids had an amazing time. We enjoyed every riad, kasbah, tent and meal you reserved for us! I will recommend this tour to friends! We have had a brilliant time away, and our Morocco experience was fantastic. Trek Guide: Rachid. Fantastic 5/5. Very nice young fellow who was very attentive to Sally who was fighting off a bug during the trek, and managed the pace to ensure that she and Lucy finished it. His English was also very reasonable and we were able to communicate fairly well during the two days. (Our command of the Berber language on the other hand is still surprisingly rusty but we managed to get a few expressions under our belt alhumdulillah!). We enjoyed the walk very much but really had no idea what to expect. Given the gradients and altitude, it would have been rated medium at least but probably hard in the Australian bushwalking guides - but I had a chuckle when Rachid said that it was easy! and we do some hard walks here at home. Whilst it's reasonably high at 2500m for people accustomed to living at sea level, the impact was only marginal, though our son Ben did have a headache for most of it. A little more information in your guide about expectations would assist (and I'm thinking here of people like us who weren't travelling to Morocco just to walk). The accommodation was very basic but fine given where we were and what we were up to. It was extremely cold of course but Rachid arranged for some blankets to augment the sleeping bags and we were fine. The sleeping bags were also perfectly fine by the way and looked hardly used - they were just extremely thin, without the blankets they would have been hopeless! The village was an awe inspring glimpse into the past - biblical housing with satellite dishes! Driver: Yusef. Fine 3/5. Completely different character to Rachid though. It's a challenge for sure to keep the conversation up for six days when your Darija is as rough as ours and the English is not so good - but this is getting picky given where we were. Dar Hanane - fantastic - probably best of the lot - 5/5. Felt like home. Stuart and Mandy very welcoming and key staff were excellent. Kasbah bab Ourika - 3/5. Why? Being rated at 5 star and given the tariff, our expectations were of course high. It was very nice, but for the money you might expect a bit more polish or something. It certainly had a feeling of subservience in relation to the staff - having come from Dar Hanane where the staff were all happy and relaxed, Bab Ourika had a comepletely different feel. The food was also very average. Sally says she could cook at the same standard at home!! Dar Adrar - 4/5 Great. Very neat and tidy - great service - nice homely feel. Kasbah Ellouze - 4/5. Again very nice. Sally did notice holes and stains on the sheets(!) but overall very nice and great service. It wasn't ask clean as other places. Dar Sidi Buono (M'Hamid) - 3/5 - a bit tired but again OK for what it is. Nancy was lovely - very engaging and enchanting and service from the staff was OK. Luxury Desert Camp (erg Chigaga)- 4.5/5. Brilliant concept, very novel accommodation, terrific service. BoBo was brilliant - very interesting and engaging individual who could just about write the text book on marketing and customer service. The food we ate here was about the best we had in Morocco. To produce that kind of fare in a tent kitchen was a miracle although both Ben and Sally ended up with food poisoning following the desert but not sure where it came from. Interesting for you to note this just in case anyone else reports it. Dar Qamar (Agdz) - 4/5 - just a bit out of the way - so tricky to get back into town without a car. We would have walked if Sally and Ben were feeling better. This was always going to be a challenge given that we couldn't walk into your office to discuss things, but overall I think everything was just fine. We didn't have a hitch and you or Anna were available for a chat when we needed it - we just needed to be organised with the specific questions needing answering. Mohammed was also very professional and helpful on the ground and was available by phone when needed. He also went out of his way to organise for Ben's fleece top to be collected from Agdz when he had left it at Dar Qamar - very much appreciated. That's it! We have had an amazing time. We enjoyed the contrasts that Morocco had to offer - it certainly is a collision of the ancient and modern. Apart from mudhouses with satellite dishes, the one thing that struck me was the nomadic Berber, who still pack up and travel with all of their worldly possessions on camels. We saw them when returning from Erg Chigaga - half a dozen camels being led by a gentleman in a jillaba talking on a mobile phone whilst his wife and daughters brought up the rear with the goats. Brilliant. So, thanks for getting us around Morocco! We enjoyed it immensely and would recommend you to people in Australia trying to organise their trips to Morocco. It has been absolutely beautiful and very very special. Thank you much for your help. Bobo was such a brilliant guide to the desert, the children loved him too, it made the whole trip in the desert extra special and brilliant. I would recommend that part to everyone, maybe even as a yearly retreat, it was so tranquil and so serene as well as extremely well organised and luxurious. Ait Ben Haddou was also beautiful, we had a good walk round on our own and explored the whole village. We also visited someones house who had been part of many films in the making there and was clearly so proud to show us his pictures. The hotel we stayed in there was ok, but not as great as others, it was a bit too posh and lacked something special, food wasn't so great, service not much either, nothing specific to complain about, just it didn't quite had what we preferred. The kasbah near Agadir was perfect, really lovely services, a fantastic castle on the hill and a little drive from some fabulous beachy places. a real recommendation with lovely pool and food and rooms and all, the kids were happy too! All in all, something to remember forever for us and the kids, thank you for your help and recommendations, its been more special, beautiful and interesting then we could have hoped for. We really have to thank your company for putting us in such capable and welcoming hands, we had an absolutely amazing experience with the two guides that conducted us from Marrakech to Erg Chebbi and back, and recommend a tour with either as highly as is possible. Our main guide, Ilyas, was a wonderful tour leader in every respect, displaying a comprehensive knowledge of local history and culture. His enthusiasm for these subjects was infectious -- there's really nothing to help a place come alive like somebody who really knows it, loves it, and loves sharing it, and this is certainly a description of Ilyas. Aside from his helpful asides about out-of-the-way places that we passed on our whirlwind few day trip, or lessons on Amazir language and culture, Ilyas really did everything he could to make sure that we felt at ease and comfortable. Spending a couple near uninterrupted days in a small car with new acquaintances really helps one appreciate this. No question that we had was foolish, no request to stop ignored or unheeded. When we asked to stop somewhere for some camel milk, for instance, both Ilyas and Mohammed (our driver) took this request very seriously indeed. Combined with the clinic that Mohammed put on when it came to cornering and basic highway citizenship (police would recognize him along the way, and ask him for reports on highway accidents), both Jason and I are sure that we couldn't have asked for any better pair of guides to conduct us on our journey. We really enjoyed both the Toubkal climb and the dessert trip! Very well organised. We had the same guide for both, Elias, who treated us pretty well and was extremely flexible on changing routes or stopping where we wanted to. If I have to pick on something, and I may be a bit too fussy, is that he knew and explained broad historical/cultural issues but sometimes it felt that it was a bit limited. Probably give him a 4/5. Very good service arranging/organising the trip prior and during it- sorting out taxis, etc. Super reliable. Give you a 5/5. Very good overall impressions. Very well selected routes and very enjoyable experience overall. Give you a 5/5 again and will definitely be looking for tourdust trips in the future! We had a wonderful time on our trip through Morocco. We would rate the experience a 4/5 overall and Tourdust a 5/5. We had a wonderful time seeing the Moroccan country side. The only negatives were the extensive driving time (couldn’t be avoided) and that we wish we’d had a little bit more time on our own. We loved both our guide and our driver, but four days straight together was a little much. Tourdust did a completely perfect job coordinating the trip. I was sure SOMETHING was going to go wrong. But the only things that did were our own errors (such as arriving at the airport too late). Thank you so much for your help! We hope to use you again on a future trip. It was obvious from the start of the trail that the guides know their job well I've been trekking and mountaineering for 30 years and I was confident that the group was in safe and experienced hands. We had a great trip and will be back again in the future for more of the same. Overall tour was fantastic, our tour guide was really really friendly and made a big effort to ensure we got to see the key attractions on the road to the Sahara, very enthusiastic and knowledgeable. The guides in the Sahara were equally good, overall a great experience and one of the best activities we did in Morocco. My thoughts on the trip was that it was over all an amazing experience. The Erg Chebbi trip was the most enjoyable part of our stay in Morocco, Im glad we booked it through yourself as everything ran smoothly and we feel we got an excellent service. We heard some bad experiences of similar trips but were a lot cheaper so I think you get what you pay for. What a really wonderful trip – many thanks to everyone involved in making it happen. Riding over dunes in the desert at sunset has to be a once-in-a-lifetime experience, watching the sun going down behind the orange glowing sand and crescent shaped shadows. I found, to my great relief, that camels are actually quite cooperative animals – or maybe that was down to our guide, Zaieed, who led them patiently for an hour, until we reached our tent. Then a delicious tagine, cooked on the spot, followed by sleeping under the brightest moon and stars imaginable. To top it all, we set off (again guided by Zaieed) in the morning while it was still dark so that we could park our camels on the side of a dune so we could clamber up and watch the sun rise. Pure magic. It was a long drive down to the desert from Marrakech, but we stopped off at some fascinating places along the way, and enjoyed getting a feel for Moroccan villages after the bright lights of Marrakech. And the drive was worth every minute for such a wonderful experience. Firstly, you guys at Tourdust- what can I say really?! perfect service, informative, timely, reasonably priced etc etc Can't fault you, thanks so much, i'm really glad we didn't leave it to our Riad to book or just risk someone selling tours on the side of the road when we got there! The few extra quid was very well spent. We had 2 guides (just for Andy and I!) the whole time. Met us at our front door and dropped us off practically at the next front door. EXTREMELY sensitive to our wimpy British needs (always checking we were cool enough, had enough water, wanted to take pics, stop for lunch, loos etc) They couldn't have been more thoughtful, even moreso considering they were both without food and water all day because of Ramadan. Things that may be useful in terms of other clients doing the same tour and asking questions: we had no idea we would be travelling quite so far, so although the first and second day were fine and split up with visits and obviously a night in a hotel, the full journey back on the 3rd day was a marathon. I think we stopped twice for the loo and once for lunch in almost 12 hours because there was so far to go. We also had no idea we'd be leaving our guides once we got on the camels, and trekking 4km to the camp. Our Berber 'host' there was amazing, the tagine the best we had the whole holiday and the 4 other guests a real nice bunch. But we then trekked back at 5am to see the sunrise. Again, a fab experience but we were in shock when we were told at camp we'd be getting up before 5am and going back on camels as 1- Camels are the most uncomfy beasts ever, and 2- We were absolutely knackered! Our customers agree - a conversation with an expert makes for a better trip. Call us now or request a call back out of hours. Which companies have you travelled with before? I'm interested in receiving occasional trip ideas and special offers from Tourdust. 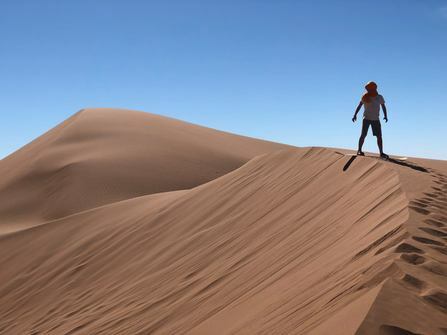 Explore Marrakech and the magnificent Sahara Desert in style with a superb desert camp experience.